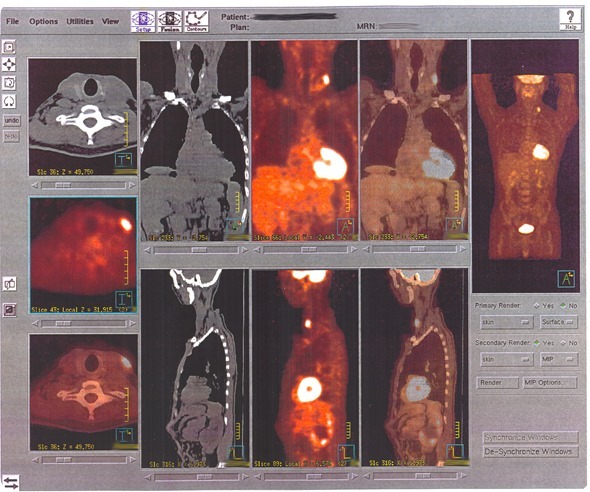 PET scans are able to detect biochemical changes in an organ or tissue. These changes can be attributed to the onset of a disease process before any anatomical changes are visible on other imaging processes. In PET scans, a radioactive tracer is injected into the patient’s bloodstream. The tracer is then absorbed by the target tissue. The level of absorption of the tracer is seen on the scan, which gives the doctor an idea about how the organs and tissue are functioning. The scan is able to detect the positively charged particles (positrons), which are emitted as the radioactive tracer is broken down inside the body. When the positrons are emitted from the decay of the tracer, they are able to travel a short distance in the tissue, during which they interact with electrons. The interaction of the positron and the electron causes both to be destroyed in an annihilation reaction. This results in the generation of a pair of gamma ray photons, which travel in approximately opposite directions, in order to conserve momentum. The gamma ray photons are detected by a photomultiplier-scintillator combination which is positioned around the patient. The computer is able to calculate the position of the source of the tracer by finding a line which connects both of the emitted gamma ray photons which arrive at the same time. As many cancer cells are highly metabolic, they metabolize the radioactive tracer (e.g., radioactive glucose), at a much higher rate than the surrounding tissues. This higher metabolic rate in the cancer cells causes a bright spot on the scan. This allows the doctor to locate and evaluate the extent of the cancer and even track the effectiveness of a treatment on the patient’s cancer. PET scans have been used to help doctors to diagnose Alzheimer’s disease. The scans are able to highlight amyloid protein plaques, which are a hallmark of Alzheimer’s disease. Although it is possible for people to have these plaques without having Alzheimer’s, this might be able to allow doctors to diagnose Alzheimer’s earlier. This is due to its ability to measure the metabolism of glucose in the brain. The uptake of glucose has greatly improved the accuracy in diagnosing a type of dementia which is often misdiagnosed as Alzheimer’s. This was found through a study lead by the University of Utah. It was found that frontotemporal dementia has a distinctive pattern of activity in the brain, with low activity in the front of the brain in comparison to the low activity of the back of the brain in Alzheimer’s. 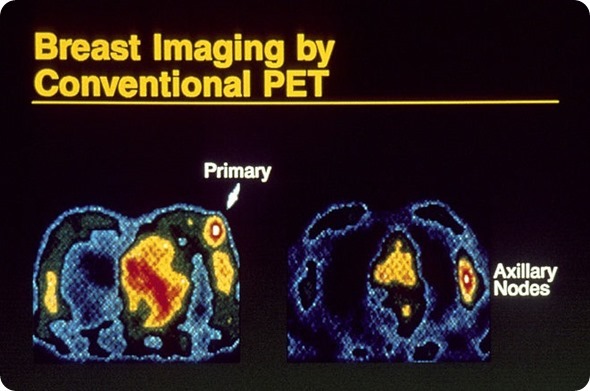 PET scans can also be used to scan for cardiac diseases, locate the focus of seizures in the brain for epilepsy, and the scans are used in medical research. Other uses also include evaluating any brain abnormalities and identifying any areas of the heart which are damaged or would benefit from a procedure, in addition to the mapping of the normal functions of the brain and heart. A PET scan uses a tracer as radioactive as that used in most CT scans, and the radiation levels used in the PET scan are too low to affect the normal processes in the body. While possible, it is very unlikely that there could be an allergic reaction to the radioactive substance used. Reactions include swelling, redness or pain at the injection site, though these symptoms soon disappear. Women who are breastfeeding or suspect that they might be pregnant should consult their doctor before having this test. This is because infants and babies within the womb are far more sensitive to the radiation as their organs are still developing.